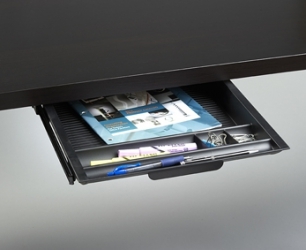 The Custom Accents® pencil drawers feature a generous amount of storage space packed into a low profile of only 2″. Each Pencil Drawer id designed with deep storage compartments for larger items, such as cell phones, note pads, and even Custom Accents® catalogs, as well as smaller compartments for pens, clips, and other office products. The compartments of the Pencil Drawers are ribbed to prevent items from sliding around and help to keep the drawers organized. The included ball bearing slide rails allow the units to smoothly open and shut with very little effort. The units are easy to install with the included hardware and are available in two convenient sizes.